One of the most successful franchises in cinema attempts a return to glory in a weekend that's short on quantity, but long on hype and familiarity, as Hollywood attempts to turn its futures around. Originality hasn't been paying dividends of late, so maybe it's time to go back to the tried and true. A 14-years-later sequel to the most recent Jurassic Park film and 22 years after the original Spielberg film, Jurassic World is a return to the venerable dinosaurs-eating-people genre with dash of social/corporate satire. After the multiple disasters of the previous films, the park itself is finally up and running, or should I say has been for many years of incident-free operation. The prehistoric zoo/safari is facing flagging attendance, though, as audiences have tired of the same old thing. In response (meta-referential theme alert! ), the company behind the park has invented a new, scarier, fiercer predator dinosaur to drive audiences. Indominus Rex, as it's dubbed by the park, turns out to be a pure beast of destruction, with camouflage skin and a thirst for murder. Before you can say “nothing can possiblai go wrong,” we've got an escaped apex predator amidst a park full of tasty tourists. In steps our rugged hero, played by newly-minted Great Big Damn Action Hero Chris Pratt, here looking for all the world like Burt Macklin, Dinosaur Trainer. Able to communicate with and command a team of velociraptors – wait, no, where are you going – he attempts to rescue a group of stranded visitors and bring down the beast before it escapes the confines of cozy Isla Nublar. Playing his foil is Bryce Dallas Howard, the park's operations manager, who's interested only in ramping up the excitement of the park and played with icy efficiency (look at those bangs! Trimmed with a paper cutter!). 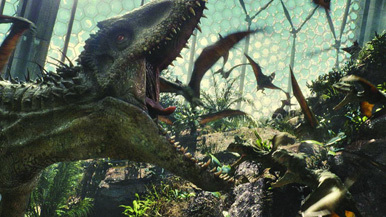 With a slicker sheen than Spielberg's original (confession time: that film's always left me a bit cold and the honest monster movie spectacle of III has always been my favorite of the series), Jurassic World isn't aiming for as much cultural significance, but rather just bigger thrills (I told you about that theme). Director Corey Trevorrow (I mean, who else would you pick for a $200 million film but the guy behind Safety Not Guaranteed?) for the most part lacks Spielberg's creative touch but in terms of providing a serviceable action film, he does seem to be up to the task.